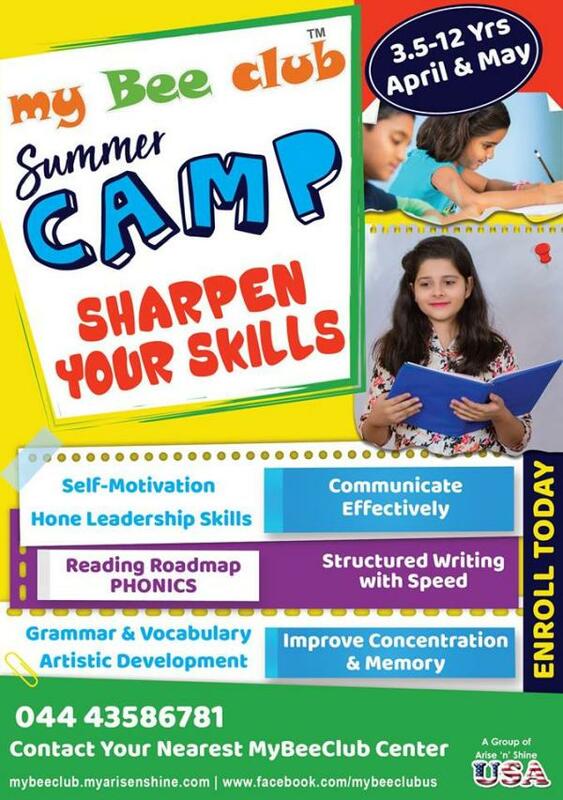 MyBeeClub Proudly Presents the Sharpen Your Skills Summer Camp!At My Bee Club, we take a scientific approach to understand the learning styles of each child and the way their brain functions using cognitive psychology. There are three types of learning styles based on sensory perception; visual, auditory, and kinesthetic. We perform individual assessment to gain insight into areas that the child needs to be nurtured and maximise learning using cognitive science. Contact us at 044 43586781 for details. Check out your nearest MyBeeClub Center for a skilful summer experience; Adyar, Anna Nagar East, Anna Nagar West, Ambattur, Ashok Nagar, Avadi, Cuddalore, ECR – Neelankarai, Hyderabad, Kattupakkam, Kelambakkam, Kilpauk, Kodambakkam, Kolathur, Korattur, Mogappair, Nolambur, Pallikaranai, Perambalur, Periyar Nagar, Perungudi, Pudhukottai, Purasawalkam, Fairlands, Salem, Thiruvanmiyur, Valasaravakkam, Velachery, Villivakkam & Upcoming centers.